"WG.90 - TREE CROSS -two ancient symbols - (8 in.)" TREE CROSS: The tree cross joins two ancient symbols, the tree and the cross. The tree unites the material earth with the spiritual heavens. In the bible there is the tree of life, earthly paradise with its seductive fruits and the tree of knowledge of good and evil. The tree, with its annual renewal of foliage, promises life's continuity. The cross joins the horizontal (feminine) with the vertical (masculine). By the resurrection it promises life everlasting. 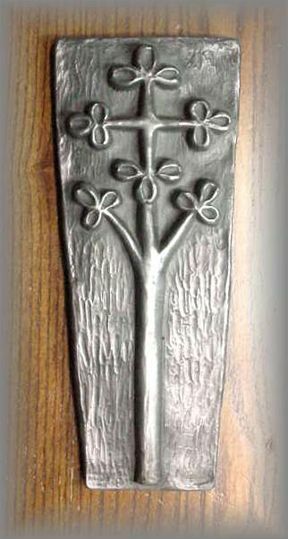 HAND CAST IN KINSALE IRELAND BY WILD GOOSE STUDIOS: Each of these beautiful reminders of our faith is hand cast in bronze and in iron. A shell is formed in metal then filled with a resin. Each piece is then polished, leaving a deep rich patina. This remarkable technique creates a plaque that is not only beautiful but lighter in weight as if solid bronze, would be very heavy and very expensive.